The pedagogical tool we want to employ within this new assessment model is the digital portfolio. The digital format facilitates assessment practices that would not be possible in a traditional portfolio. For instance, digital portfolios easily allow students to submit multiple versions of assignments, including writing tasks, video clips, audio recordings, and presentation slides. This format also allows tutors to provide individual and collective feedback in both written and oral form, and to upload helpful resources such as video presentations. A portfolios is often described as ‘a collection of work that has been compiled over a period of time’ (Johnson et al 2010, p. 5). However, there is no one definition of a portfolio, rather, it is the purpose behind using the portfolio as a tool for assessment that decides what type of portfolio one is working with (Klenowski 2002). In a showcase portfolio or “performance portfolio”, students typically display their “best” work, usually after revising several drafts (William 2011). However, what we are aiming for in this project is a “learning portfolio”, which incorporates both early drafts, reflection notes, self-assessment notes, written and audio-recorded feedback from peers and tutors, and revised assignments. As Hung (2012, p. 22) writes, ‘[p]ortfolios provide an opportunity for learners to monitor their own progress and take responsibility for meeting goals’. A learning portfolio, then, promotes active learning and student agency, encouraging students to reflect on the process of their own learning. It also allows the tutor to take the students’ progress and their strengths and weaknesses into account when planning their own teaching. 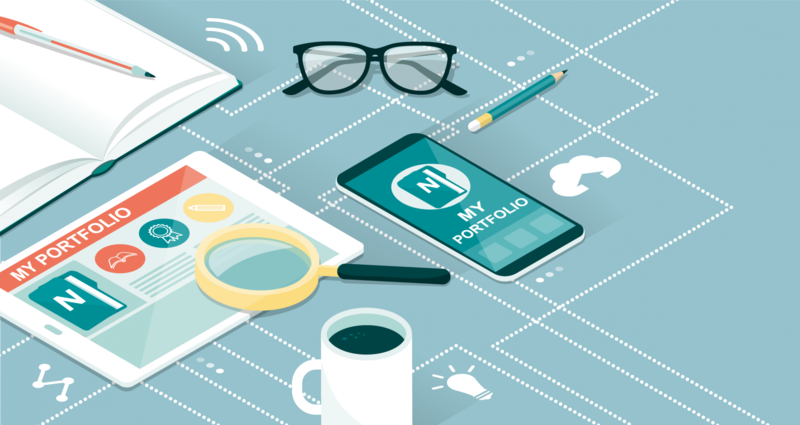 Portfolios are useful tools for assessment due to their formative potential (Burner 2014), which is linked to the portfolio’s process-oriented nature. Both self-assessment and peer assessment can be a natural part of portfolio assessment (Black et al., 2003). Students have to decide which pieces of work they are most satisfied with, and what they have learned over an extended period. Another advantage is that the learning process takes centre stage (formatively) even as students share their products (summatively) (Wittek 2007). Portfolio assessment allows for the clarification of the relationship between tasks, students’ effort, teacher’s guidance, assessment criteria and learning achievements (Engh, Dobson & Høihilder, 2007, p. 83). In other words, the use of portfolio assessment facilitates constructive alignment (c.f. Biggs 1999) of the learning system.